How often does one stock go down or up based on news from a stock in the same industry. Sleep number stock is under pressure (you can read the article here https://seekingalpha.com/news/3451714-sleep-number-shares-sink-q1-sales-margin-disappoint?app=1#email_link I was hoping Leggett and Platt would go down in sympathy. Here is why. Leggett and Platt is a very diversified company that supplies among many other items, bedding. I was hoping Leggett and Platt, symbol LEG, might have a similar down turn as Sleep Number, symbol SNBR, down $7 or 15% as of this writing. But LEG is holding up. I like Leggett and Platt, symbol LEG; three portfolios hold LEG, 2011, 2013 and 2014. Click on the year to read the original post. It's not an exciting stock. Not a stock with a lot of call option excitement. But as you can see with the history in this blog that it is a steady source of income for we income investors. If I were constructing another income portfolio, I would add LEG to it. To be a "Dividend Machine" a stock has to have a history of increasing the dividend over time. LEG fits that bill. Inflation, not the CPI number or the one used by the "Fed" but the inflation I measure, is about 3.8%. I would like to see my income go up by 3.8%. I can stomach ups and downs in the value of the investment if it is basically safe and continues to raise my pay. You can see in the table under FUNDAMENTALS, the last three year dividend increases have averaged over 6%. Take a look at the longer term dividend history and you can see even during the very difficult period of 2008/2009, LEG delivered safe and increasing income. While, the vast diversification of this company may be a good thing or a bad thing, I can only go on past performance and the data available. One of part of LEG management I like is the stated goal of increasing total share holder value through, growth as well as returning money to shareholders through dividends and stock buybacks. For an income investor, those are very nice goals. April options expire today and I will have some money to invest. I am going to add LEG and hope the bed bugs don't bite. I follow and write about SWKS often because it pays a dividend, and has a P/E price earnings ratio of 14.5 which makes it look like a bargain. Qualcomm carries a P/E ratio of 36.56. And, as my readers know, I love a stock that also has call option potential. SWKS fits all the criteria. 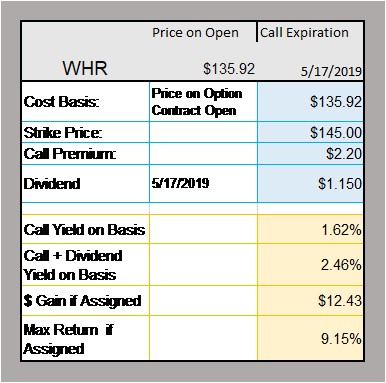 I bought some more SWKS today but hedged my bet by selling a call with an expiration date that captures the dividend, I hope. SWKS has not release the next ex-dividend. Last year in May the ex-dividend date was May 25 which is after the monthly call expiration date of May 17. However, in previous years the ex-dividend date in May has been earlier and you might consider a call with a May 17 expiration date rather than the May 31 expiration that I chose. Be aware this stock can be volatile, but you do get paid to wait. It could exceed the strike price before the expected ex-dividend date making your shares vulnerable to be called away. You always get to keep your call premium. If you are called away and only get the capital gain (difference between your basis and the call strike price or $8.20) plus your premium of $1.05, your gain falls to 10.07% below the 10.49% you would get should the shares be called away. Most likely, however, you will keep your shares with a basis of $91.80. Remember 90% of options expire without action. With the full year's dividend of $1.52 and this call premium of $1.05, your income from SWKS for the next year would be 2.799% which is better than a short term treasury. Of course with a short term treasury note or bond, you principal is safe. Whereas, Skyworks' value could go down below your basis. 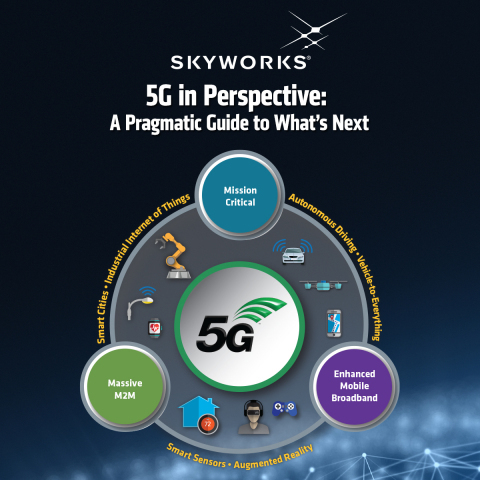 Since earnings and revenue growth are solid and Skyworks has no debt and Skyworks is in the thick of the next 5G generation, I feel this is a risk worth taking. Moreover, I may be able to sell more calls over the year boosting my income. Riot block chain technology stock, symbol RIOT. If you have ice in your veins, you could consider this call. While I like the greater than 3.5% dividend yield, I am not so in love with this stock that I just can't lose it. I always tell my readers, if you love a stock, especially one that feeds you with a healthy dividend, don't sell calls on it. You risk having your income called away with the underlying stock. Whirlpool is not in that category. Frankly, with the calls I have written (sold) on this stock my income runs about 6% per year. But, I have suffered through massive stock price changes. It has been a bumpy ride. Moreover, if you look at the previous calls, you can see the strike price today is lower than in previous calls. I really prefer to ladder up instead of down. But, I am still above my basis on this lot so I am actually hoping WHR is called away. The table below shows why I am willing to have WHR called away (also known as assigned.) Revenues and dividends are growing but look at those earnings. EPS (earnings per share) have taken quite a hit. WHR wrote off over $9 per share in the second quarter of 2018. I sold this call today and it was snapped up quickly. As I call it, wringing more money out of Whirlpool.